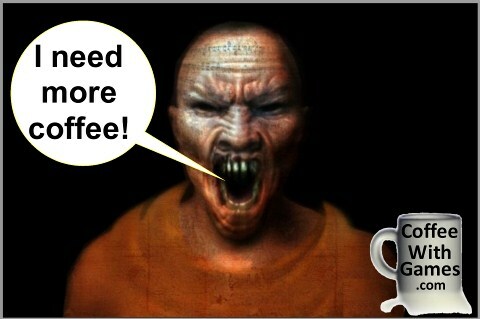 I don't think many would argue with this guy! Cursed Mountain was released for the Wii on August 25, 2009 with a MSRP of $49.99. The game was developed by Deep Silver - Vienna and published by Deep Silver/Koch Media, but the Deep Silver Vienna studio office was closed in early 2010 and I believe Cursed Mountain was the only game developed/shipped from the studio. Cursed Mountain received a "Mature" rating from the ESRB with "Blood, Sexual Themes, Violence" listed as content for gamers/parents to be aware of, and it is described as a "survival horror game". 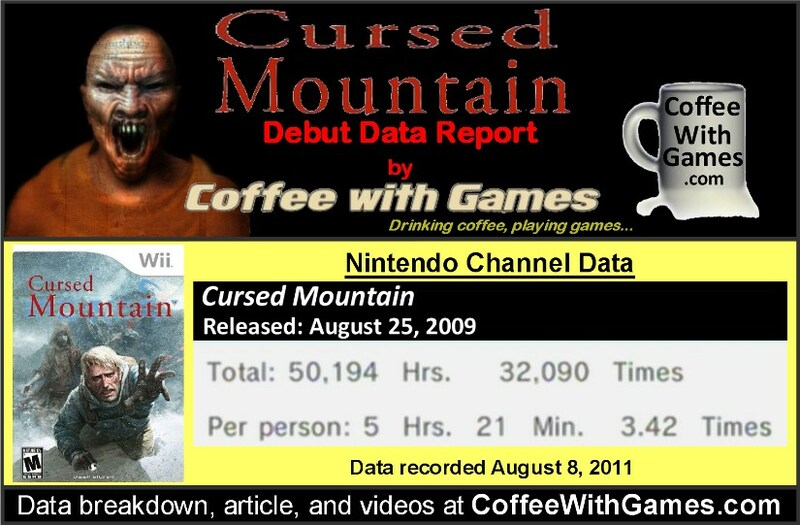 How many hours have Wii owners spent in the freezing Himalayas with Cursed Mountain during the last 713 days reported? Let's take a look! that have played the game. 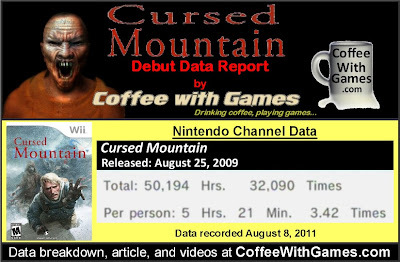 Cursed Mountain has had about 9,383 Wii owners report their play-time data since the game released on August 25, 2009. Cursed Mountain has 50,194 Total Hours of game-play reported with an average play-time of 5 Hours 21 Minutes "Per person" that has reported data. The game has an average play-time of 1 Hour 33 Minutes per session played. Cursed Mountain has two versions available on Amazon.com, a regular version and a "Limited Edition" version that included a "Bonus Disc with 15 tracks of in-game music and a 5-part 'making of' DVD. Interior Art in Steelbook case." Cursed Mountain's standard edition sale rank on Amazon.com is #1,946 and it is currently selling for $7.40. Cursed Mountain's Limited Edition Amazon.com sale rank is #5,485 and it is currently selling for $8.80. Cursed Mountain's "professional" review score average is 68.89%, based on 36 reviews on GameRankings.com. The game has about a 4 out of 5 Stars rating on Amazon.com, based on 45 customer reviews between both versions of the game. Cursed Mountain's customer review score average is 77.77%, when the customer reviews are converted to a 100% review scale. As for the reported game-play data, being that it took Cursed Mountain almost 2 full years to debut I think shows the game was definitely a slow/low selling game, but the fact that it has debuted is still better than some other Wii games(Spyborgs) that have not yet debuted. Before seeing this reported data, I didn't recall how long the game was. Seeing the average hours reported "Per person" being just 5 Hours 21 Minutes is a lot shorter than I was expecting, because for some reason I thought the game was between 8-10 hours long. Knowing Cursed Mountain released with a MSRP of $49.99, and now seeing it available for less than $10 on Amazon.com is definitely tempting, but I'll hold off until I finish some more games on my backlogged list. So, while the game definitely did not debut as fast as other Wii titles have, the fact that is has debuted I think shows that Wii owners are surviving(and enjoying) the high altitudes and freezing temperatures the game apparently throws at them. If you have not played Cursed Mountain is it a game you are perhaps interested in like myself? If you have played it, is it a game you would recommend to other Wii owners, and did you find yourself playing through the game more than once? Also, do you remember about how many hours it took you to complete the game? I played the game two years ago upon release. It's a game i always recommend whenever i have the chance. It may be flawed (slow gameplay, controls feel archaic) but it had a good story, good settings, good voice acting. it is also, together with silent hill: shattered memories, the only pure survival horror on the platform and a fresh take on the genre. i think review were too harsh with the game, IMHO it should be in the mid-70s range. "i think review were too harsh with the game, IMHO it should be in the mid-70s range." Kind of interesting, because that's where the customer review score average is...sitting at 77.77%. "if i remember correctly it took me about 8 -9 hours to complete the game, only because i spent time looking for some hidden optional story objects." Thanks for the feedback on the amount of time it took you to complete, and that there are the "hidden optional story objects" to look for. You're play-time is what I thought I had heard, and perhaps it was 8-10 hours with finding all the optional story objects as you did, though it appears that most Wii owners that have reported data are just sticking with the main story and not searching out the other objects. Again, thanks for stopping by and providing the feedback! Am I crazy for not ever hearing about this game?! I was definitely interested in the game until I saw how clunky the controls and gameplay was. I can't stand controls that don't feel right, though this has reminded me that I should watch a playthrough for the story. I played this game and enjoyed it's setting and mood for sure. It's unique and intriguing. However, I found fighting clunky and the cut-screens (still images with voice over) were horrid IMO. In the end I never did finish playing it and from the reported data, I suspect most people didn't either. However for under $10 it's definitely worth getting if your into suspense/horror games or unique games in general. No, you're not crazy. It was released like most Wii games with basically no advertising or knowledge on the game outside of a few online sites. You know, I saw on Amazon that there was supposedly a PC version for this, and then I quickly checked Steam, but it wasn't even listed there...so I don't know if it ever saw an official PC release or not. I did hear about the clunky controls, but I know some think the "horror/suspense" games should have clunkier controls by design, because it helps add to the atmosphere...at least that's what I've heard about the original Resident Evil games and I think Silent Hill games. Thanks for the feedback on your play-time with the game, and I think for under $10 it wouldn't hurt to give the game a try, especially considering it'll probably be hard to find in a few years. Thank you all for the comments/feedback so far! I appreciate it!